On the inside, the Scorpio comes equipped with leather wrapped steering wheel and gear lever, new mobile holder slot and bigger cubbyholes. In terms of features, the new Scorpio gets reverse parking camera with dynamic assist, one-touch lane change indicator, auto window roll-up, six-inch touch screen infotainment with Bluetooth/ CD/ DVD/ USB/ Aux, driver information system, Steering mounted audio and cruise controls, cushion suspension and anti-roll technology and shift-on- the-fly 4WD system. The SUV also gets Intellipark, tyre-tronics, rain and light sensors, micro hybrid technology, gear shift indicator and voice assist system. 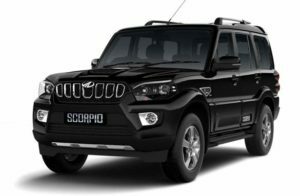 The new Scorpio comes loaded with safety features such as front dual airbags, ABS, panic brake indication, collapsible steering column and side intrusion beams, engine immobliser, anti-theft warning and seat belt reminder lamp. The vehicle also gets speed alert and an auto door lock. Mahindra Scorpio is comprised with caliper type ventilated disc brakes at the front while at the rear, drum brakes are present. In addition to this primary braking system, there comes Anti-lock Braking system as secondary braking system for immediate and emergency braking purposes. Although, ABS ain’t a standard safety feature across the entire variant range but it is available S6+ trim onward on this SUV. The company has offered dual front airbags as safety feature, albeit with top-of-the-trims – S8 and S10. However, the S6+ trim comes loaded with a front driver side airbag as standard feature. In addition, there are side intrusions beams for added safety; but, what irony, the entry-level S2 variant is even deprived of them. A special mention goes to Mahindra’s Voice assist system which timely keeps reminding the driver regarding the door ajar, seat belt warning, low brake fluid, and fuel on reserve. It is on offer with S6 grade onward as standard feature. Also, one gets to see the Tyre-tronics system with the Scorpio which is an indispensable safety feature as it keeps on updating the driver about the exact air pressure and temperature in each tyre. Apart from the aforementioned features, there are a few more features which ensure the safety of the occupants as well as vehicle, directly or indirectly. These features are Digital immobilizer, Anti theft warning, Seat belt reminder lamp, Speed alert, and Auto door lock while driving.